The RSVP Agency offers a professional and cost effective design and artwork service. We encourage you to make use of our in-house designers as we will design your artwork in line with our specifications, ensuring a quick turnaround time. If you prefer, you can have your own graphic designers design your email invitation and our online invitation management system will do the rest for you. Below please find a gallery showcasing some of our web invitation examples. In business and life, a first impression can make all the difference. By creating a memorable online experience in the form of electronic invitations with RSVP, not only does this help save our environment but time as well as money. Let us design the perfect electronic invitation for all your upcoming events. You can rely on RSVP Agency’s dedicated team to ensure your digital invitations are designed to your specifications and well received. Through our commitment to provide first class digital solutions for all types of events, our online invitations not only create lasting first impression but a high delivery rate. Our beautifully crafted and customisable digital invitation designs make it easier than ever to effectively reflect your individual style as well as redefine the way you connect with people to build lasting relationships. How you customize your electronic invitations is completely up to you. (http://www.rsvpagency.co.za/invitation-design/) or let us help you create one from scratch. Your options are limitless when you choose RSVP Agency for your electronic invitation design. Never succumb to bland invitations again. Your option for digital design is boundless with various templates to choose from – all of which are customisable to portray your event in the perfect light. Choose from a long list of stunning fonts, line spacing, text boxes, customized text colors and sizes. Choose from any one of our stock photographs or graphics, to your own images or logo in order to personalize your digital invitation. When it comes to promoting your event, email is still one of the most effective tools for a successful event turnout. With that said, a great invitation should be personalized with an individual greeting. Our team at The RSVP Agency will make sure your digital invitation stands out above the rest by evoking anticipation within the receiver and motivating them to take action and click through to accept your event invitation. The world is evolving from paper to digital at a rapid pace and with traditional invitations taking a backseat, now more than ever; a once simple e-invitation now has the ability to do more than simply announce an event or special occasion. 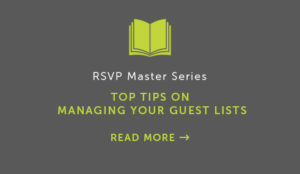 Thanks to our helpful invitation management system, each online invitation leads the guest through a well designed and user-friendly registration process. Data is collected from your guests such as dietary requirements to preferences and is then stored on our secure server where you have the ability to seamlessly check live reports that provide up-to-date stats and information on guest numbers, preferences and more. Not only that but our online invitation management system will also send confirmed guests iCal reminders that integrate with their personal devices as well as send along an SMS the day before your event for a higher turnout. In the end, digital event invitations are a catalyst for successful event promotion and planning. By choosing RSVP Agency to design your electronic invitations for your next event you’re choosing to say yes to success.